Durga is a popular fierce form of the Hindu Goddess or Devi. She is depicted with multiple (variously, up to eighteen) arms, carrying various weapons and riding a ferocious lion or tiger. She is often pictured as battling or slaying demons, particularly Mahishasura, the buffalo demon. For the Goddess-worshipping Shaktas, Durga is sometimes equated with Mahadevi, the Supreme Goddess. Her triumph as Mahishasura Mardini, Slayer of the buffalo Demon is a central episode of the scripture Devi Mahatmya. Her victory is celebrated annually in the festivals of Navaratri and Durga Puja. In Hindu mythology, Durga is a fierce form of Devi, the Mother Goddess, the all-powerful almighty goddess. According to a legend the gods could not defeat the buffalo demon Mahish, who was threatening the existence of the universe. They begged Shiva for his assistance, and Shiva advised all the gods to release their shaktis. Goddess Durga is the mother of the universe and believed to be the power behind the work of creation, preservation, and destruction of the world. Since time immemorial she has been worshipped as the supreme power of the Supreme Being and has been mentioned in many scriptures - Yajur Veda, Vajasaneyi Samhita and Taittareya Brahman. The shaktis of the gods emerged in female form. These goddesses fused together in blinding light from which arose a magnificent goddess with many arms. She was as beautiful as she was deadly. Durga was born fully-grown and is depicted as extremely beautiful and full of rage. 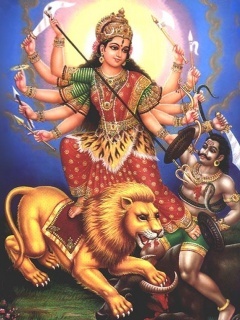 The gods called this goddess Durga, the invincible one, and they armed her with all their weapons. Thus armed, Durga rode to the top of a mountain on a lion. In a bloody battle, she defeated Mahish and his army of demons and thus saved the Universe from this demon’s menace.